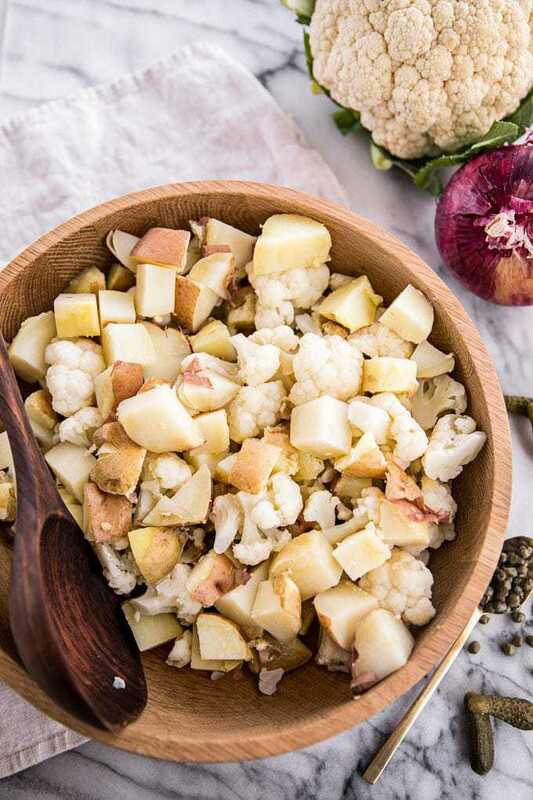 This easy Paleo cauliflower potato salad is low-carb and healthy, yet creamy and absolutely delicious thanks to the addictive tang from the pickles, capers and mustard. Use only cauliflower for a faux-tato salad that’s just as tasty and also Keto compliant. Who’s with me?! Of course, some picnic classics come to mind–coleslaw, corn salad, baked beans, and (lest we forget my very favorite) potato salad. But not just any potato salad. You can find that recipe anywhere online–heck you can even buy it premade at the deli. But that’s not why you come to Root + Revel (I hope!). 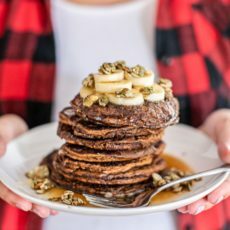 No, you come for recipes that up the nutrient ante, that promise BIG flavor alongside MAJOR health benefits, right? That’s, at least, what I always try to provide here. 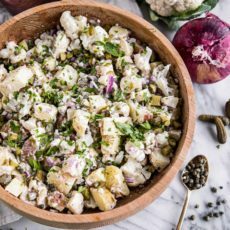 And when it comes to potato salad, we’re taking what is traditionally a carb-heavy dish often made with too much mayo that’s full of toxic oils and making it super nutrient-dense (thanks to the addition of cauliflower) and decidedly less inflammatory with the help of Paleo mayo made from avocado oil. 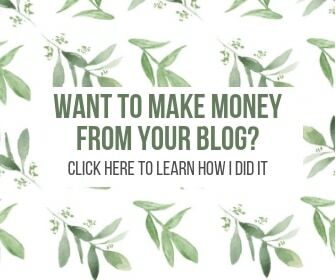 Before we really get into it, though, I want to thank my friend Ayşegül from FoolProof Living, who shared her ultimate potato salad recently and inspired this recipe. My mouth literally started salivating as soon as I saw it. And then I came across Iowa Girl Eats’ Cauliflower faux-tato salad and I instantly knew that I wanted to combine these two recipes and make a few tweaks to come up with my own version. So here we go! Easy–boil potatoes. Combine with dressing (more on that below) and any mix-ins. Done. There’s a reason potato salad is a summer BBQ fave and it doesn’t stop with how delicious it can be–it’s so quick and easy to make! For this recipe, I like using a combo of red potatoes and Yukon gold potatoes, but you can really use whatever potatoes you like. My best advice is to leave the skins on, whatever potato you use. Why? For starters, it’s delicious. 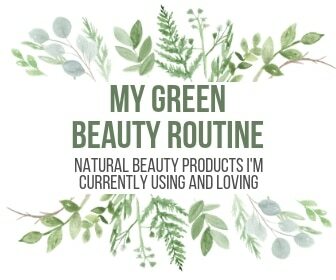 But more than that, all of the vitamins, minerals and antioxidants live in the skin. And don’t forget, leaving the skins on means one less step in the kitchen since you don’t have to peel the potatoes. Triple whammy! Just keep in mind that it’s extra important you buy organic potatoes when you leave the skins on as it’s also where pesticides hide out. Now for this particular potato salad recipe, I halved the amount of potatoes and added some Vitamin-C rich cauliflower, which also cuts down on the carbs. 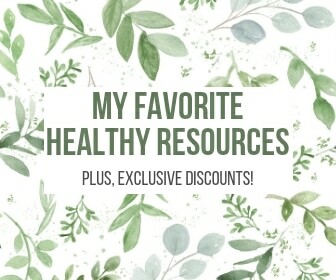 We’ll get to that in a minute, but I just wanted to give you a quick reminder that potatoes are a resistant starch that actually lowers blood sugar levels, resulting in fewer insulin spikes, and a better ability to burn fat (source). So don’t be scared of potatoes–when eaten in moderation (and not in deep-fried chip or french fry form), potatoes fuel your body with antioxidants, phytonutrients, fiber, vitamin C, vitamin B6, manganese, tryptophan, iron and potassium (double the amount in bananas!). While there’s dozens of recipes out there for Southern potato salad, Old Fashioned potato salad and (one of my personal faves) Loaded potato salad, for this recipe, I decided to stick to my summer cooking rule and keep things bright and fresh–so I added lots of tangy capers, briny cornichons (those are the little French pickles that often come on charcuterie boards) and lots of fresh parsley on top. 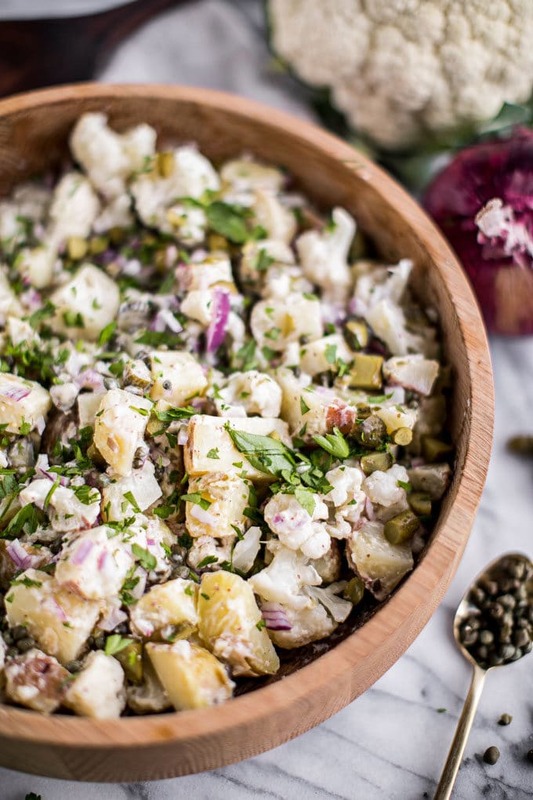 When it comes to potato salad, the dressing you use can make or break the recipe both in terms of flavor and nutrition. There’s tons of recipes that call for mayo made from inflammatory oils like soybean or canola oil, and an equal number that rely on sour cream or Greek yogurt. Personally, I like to keep things dairy-free and all-around healthy, so I rely on Paleo Mayo. I cannot stress enough how important it is to you use a high-quality mayo made from healthy oils. 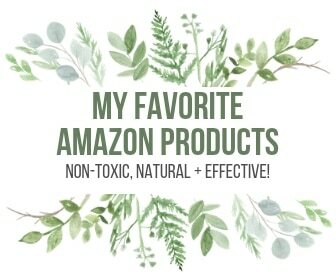 So skip the toxic Duke’s, Hellman’s, Miracle Whip, etc. and go for Primal Kitchen’s Avocado Oil Mayo (you can also buy this at Thrive Market for just $7.45). Made from a pure and nutritious blend of 100% anti-inflammatory avocado oil, organic, cage-free eggs, organic herbs, spices and vinegar, this Mayo is paleo and primal friendly, Whole30 approved and Non-GMO Project Verified, sugar free, gluten free, dairy free, soy and canola-oil free and with no trans fats, no artificial fillers, colors or preservatives. Mix it up with some spicy whole grain mustard, lemon juice and garlic and you’re in business! I’ve already sung the praises of organic, skin-on potatoes to you, but now it’s time to wax poetic about cauliflower. I know it might sound a bit strange but cauliflower and potatoes go together like avocados and lime juice. You’ve seen this combo here before in this Paleo Cauliflower Chowder and I also love making mashed potatoes with cauliflower. 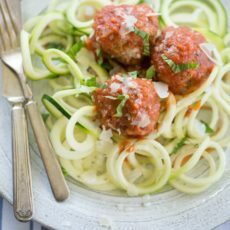 The flavors meld together beautiful, the textures are a match made in heaven and you get to add tons of nutrients to your dish without much notice–which is to say that it’s an easy way to get your kids and picky eaters to eat more vegetables without even knowing it. 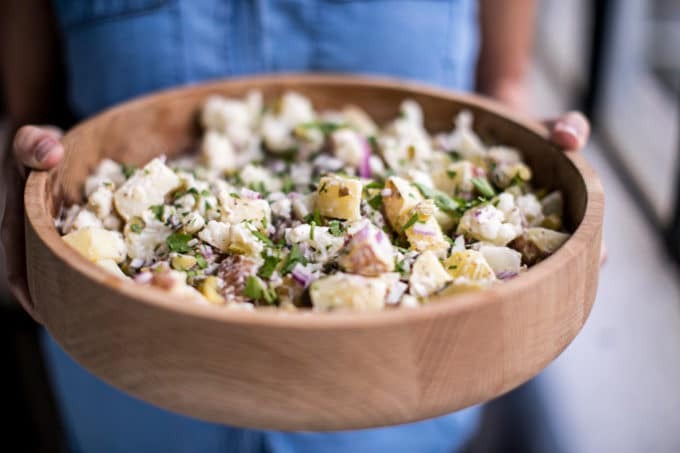 The cauliflower faux potato salad (aka Cauliflower faux-tato salad because it’s like a mock potato salad) that inspired this recipe used only cauliflower, but I like the combo of the two better and you’ll also get a wider variety of nutrients. 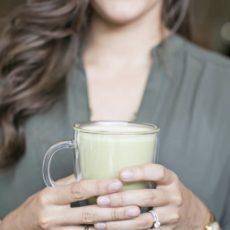 In fact, this recipe has a whopping 54% of your daily recommended value of Vitamin C (a skin-nourishing immune boost), 63% for Vitamin K (critical for bone health and hormone balance) and it’s also bursting with potassium, phosphorus, Vitamin B6 and Folic Acid. 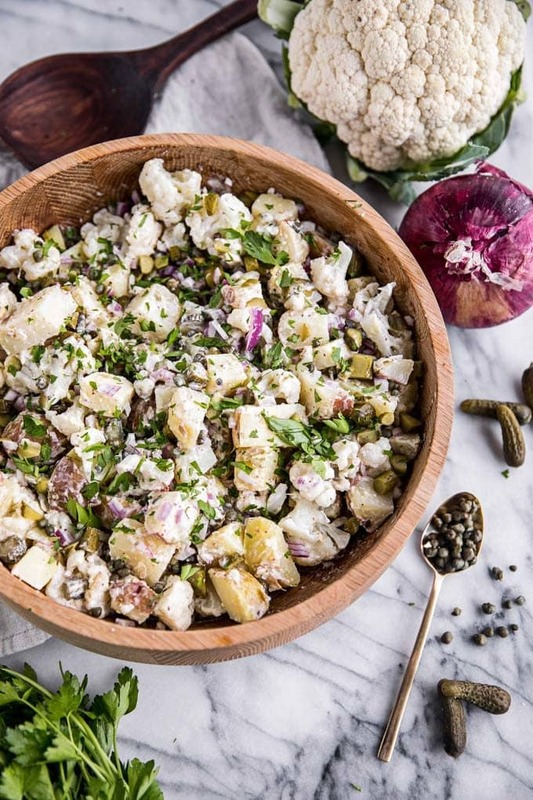 This outrageously delicious cauliflower potato salad is also gluten free, dairy free, Paleo and if you want to make it Keto compliant, you can leave out the potatoes and opt for just cauliflower (though that’s not my preference). 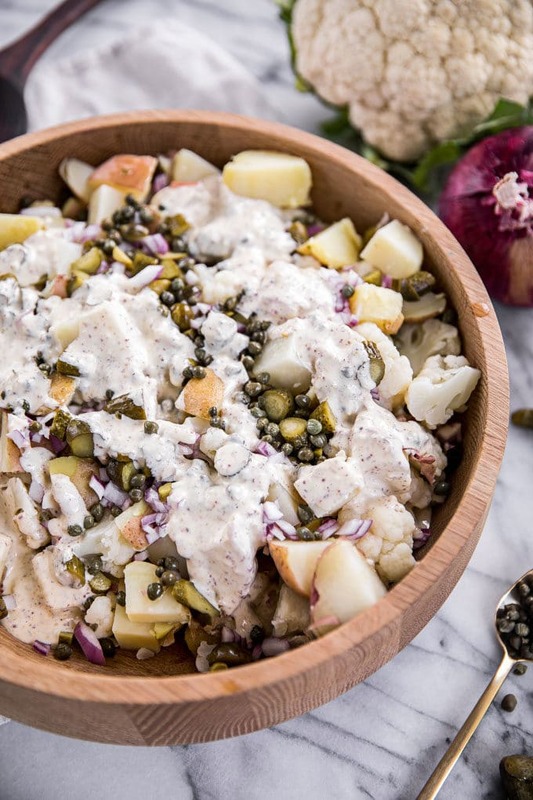 This easy Paleo cauliflower potato salad is low-carb and healthy, yet creamy and absolutely delicious thanks to the addictive tang from the pickles, capers and mustard. Use only cauliflower for a faux-tato salad that's just as tasty and also Keto compliant. Fill a large stockpot with cauliflower florets and chopped potatoes (leave the skin on). Cover with filtered water and season with salt. Cover the pot, bring to a boil and cook until potatoes are soft and can be pierced with a fork, about 25 minutes. Meanwhile, make the dressing by combining the next five ingredients (mayo through salt and pepper) in a medium glass bowl, whisking together until smooth and creamy. Drain potatoes and cauliflower once they're done cooking and allow to cool in a large bowl. Once cooled, add the capers, cornichons and red onion. Pour dressing over the salad and toss to combine. Garnish with fresh parsley. Serve and enjoy! **Note nutritional panel does not include salt + pepper.